I’m a big Batman and DC fan, and I wanted to add to the list of available figures released. First, I don’t work in the toy industry. Second, you’ll need a lot of luck. In the past, the large toy manufacturers wanted only people with engineering backgrounds. If you were artistically talented and knew all there was to know about toys, they wouldn’t talk to you. To a degree, I think that’s still true. Things have changed somewhat in recent years, though. 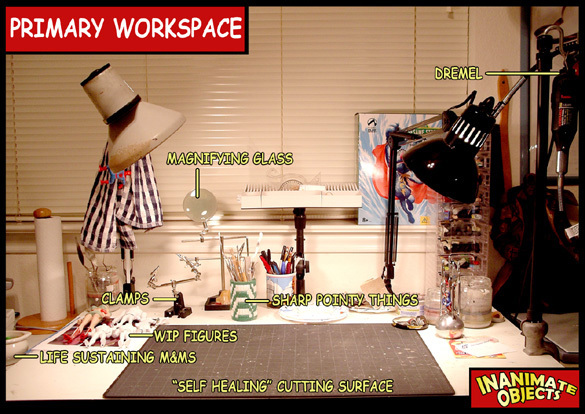 Now the large companies are more willing to farm out jobs to independent sculpting studios (like the Four Horsemen), but those studios are few and far between. Even fewer are commercially successful. Golden age comic books, of course! Specifically, old and beat up ones. When I design something of this nature, I like to start with a general theme and work my way towards the specifics. For this most recent design, I had spent weeks racking my brain for a satisfying concept. Suddenly, I found inspiration had been in front of me all along. 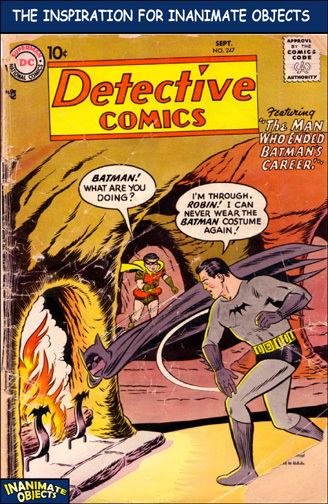 On my desk, I have framed a very beat up copy of Detective Comics #247 that belonged to my father in the early fifties. (One of the few that survived from his childhood.) I realized that was the place to start. Even the color pallette was perfect! So I pulled out my many comic book reference tomes and started to pick the golden age elements I wanted to use. The final result is the site as it appears today. Since I was old enough to watch TV. I probably learned to read with the words “Pow,” “Bam, and “Crunch.” Of course, this leads to vaguely disturbing memories of not understanding why I got uncomfortable whenever my mother was in the same room and Yvonne Craig was on TV. Another big question. Like limbs, very few heads match from figure to figure. If you’re looking at a ball-and-socket neck joint, the process can be even more complex. Regarding boil and pop: Many folks will answer this head swapping question with the boil and pop answer (see below). However, this rarely works as most neck joints simply don’t match. Boiling is good for removing a head, but very difficult to add a head. I’ve done it, but even on the simple ones I usually find it to be too much trouble. 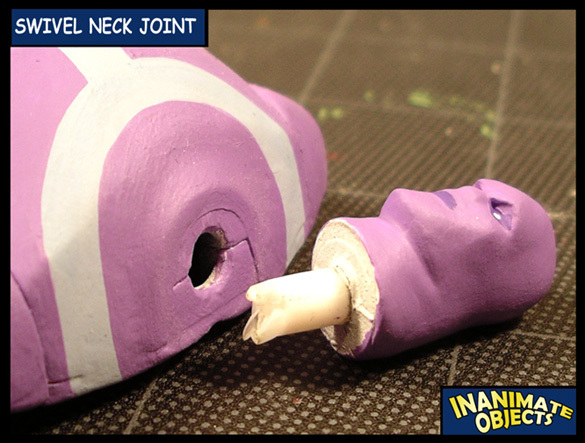 To make a simple swivel neck joint: I usually start by simply cutting off the unwanted head of the target base figure, and the wanted head of another figure. If a hole is present in the neck of the target figure, so much the better. If not, I’ll drill a hole into the neck, down into the body. I then drill a shallow hole at the base of the new head. After drilling, I find a piece of styrene rod that very nearly matches the size of the holes, cutting off an inch or so of the rod to be used as a neck peg. The peg is then Superglued into the shallow hole of the head. The head (with new peg) can now be placed into the hole on the neck of the body. 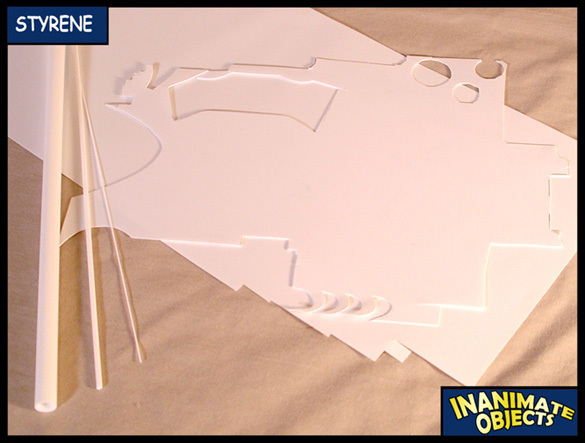 If the hole is a bit too large and fit is not snug, you can use masking or Scotch tape to increase the thickness of the styrene peg by wrapping layers around the peg. When you’re done, you have a smooth, functional neck swivel joint! This is a big question. There’s a different answer for every customizer, and for every figure. As the mechanics of almost every figure is different from another, there is no single method. For my part, I’ve never tried to swap a ball-and-socket joint, only “cut” or “swivel” joints. Lately I’ve switched to using magnets for swivel joints. They’re relatively easy to use, and frankly, they’re fun! I’ll drill shallow holes in either side of a joint and fill with rare-earth magnets. So much easier than making new pegs! On extremely rare occasions, I will take on a commission. The fact is, between work, family, and my own projects, I rarely have the luxury of time for commissions. So chances are, no, I won’t be able to create and sell a custom on demand. (And the existing figures are not for sale.) Alternatively, I hope that my web site will inspire others to try their hand at this satisfying hobby. Unfortunately, I am only able to feature my own work at this time. Sorry, but no. I simply don’t have the time or resources to invest in producing more than my share of projects. I’m always happy to offer suggestions and help. However, I’d prefer if the images were posted to a web site rather than emailed. If you must email, please be sure to send only a few files, and images of no more than 72 dpi at 8 inches tall. Please keep in mind that I live a very busy life, and it may take some time before I can reply. The shows, the comics… leftover parts. If the Joker shows up in a scene wearing a swimsuit, and I think it’s funny or it’ll look good on the shelf, chances are I’ll make it. Then I think about associations. I can’t remember Harley in a swimsuit in an episode, but a swimsuit Joker needs a swimsuit Harley. So really, there’s no specific place. I simply try to keep an open mind. When the figure is fully painted, I apply a coat of Dull Cote fist, followed by a very light dusting of Testors semi-gloss. 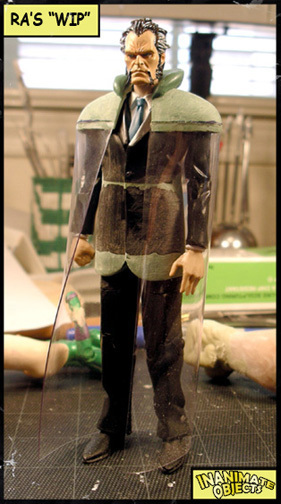 This give the figure just a tiny shine, enough to make it look like manufactured plastic, preserving the illusion! 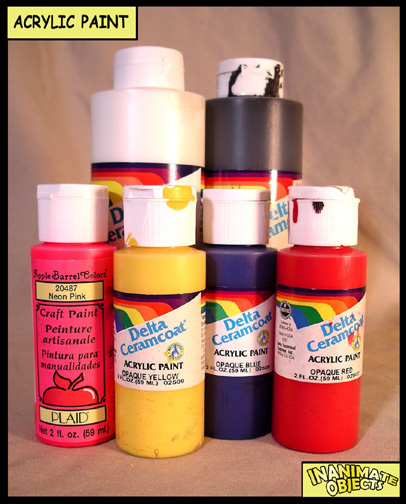 Primarily, I use acrylic paints. 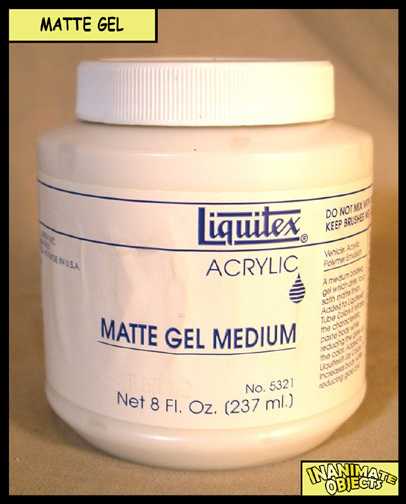 Most any acrylics will work fine, be they the $.99 specials or the high-end professional series. 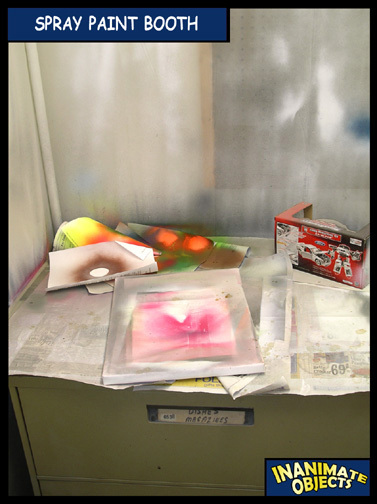 Acrylics mix easily, dry quickly, and react well with primer. 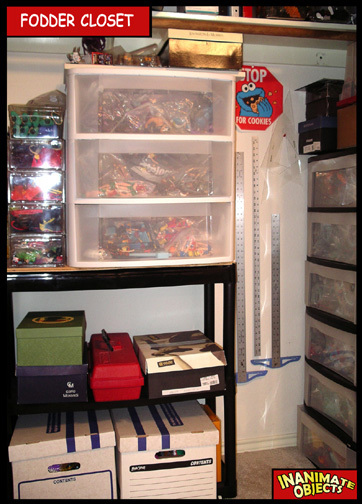 Primarily, I use the Ceramcoat brand of acryclics, commonly found in craft stores. I’ve used these since I was a kid. I know some customizers who swear a decent custom cannot be painted with these kinds of acrylics. I feel this site is a testament to the contrary, as everything you see was painted with the “cheap” paints. 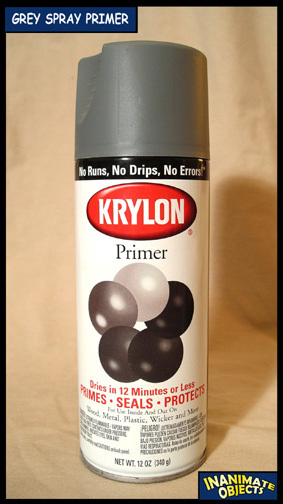 Many customizers now prefer the more expensive “Acryl” brand by Testors. 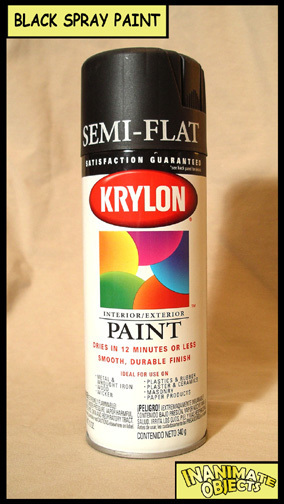 I’ve dabbled in these, and found them to be fine paints. But there’s nothing I can do with Acryl that I can’t do with Ceramcoat cheaper. First, paint on top of white. 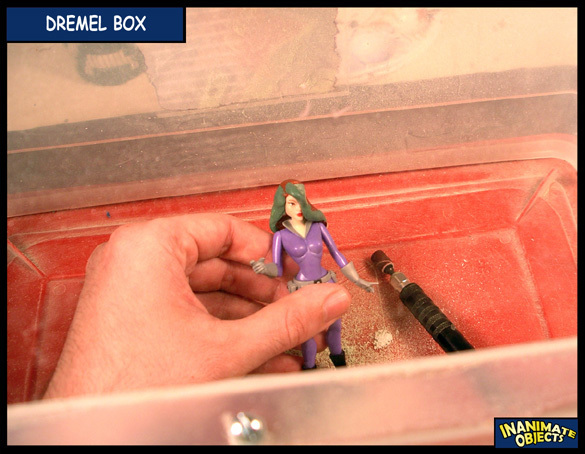 This means applying a white primer coat of some kind to the figure before you start hand painting. 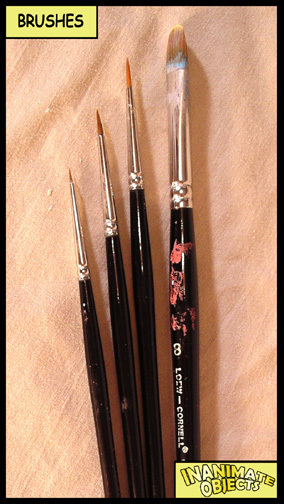 Once I start brushing on the acrylic, I usually thin the acrylics with a drop or two of water on my brush. 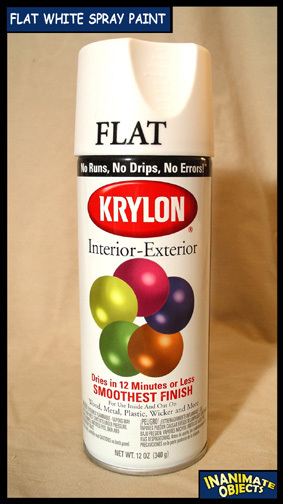 Thin coats might mean you have to apply several coats, but the smooth finish is worth the effort. I get this question a lot, and the truth is I rarely use a color straight from the bottle/tube. I try to as often as possible, as the color is easier to replicate later if I need to, but most times I have to mix colors. Unless it’s white, black, caucasian “flesh”, and sometimes pure red or yellow, then the color is probably mixed. Most hobby stores that carry Testors products will have it. 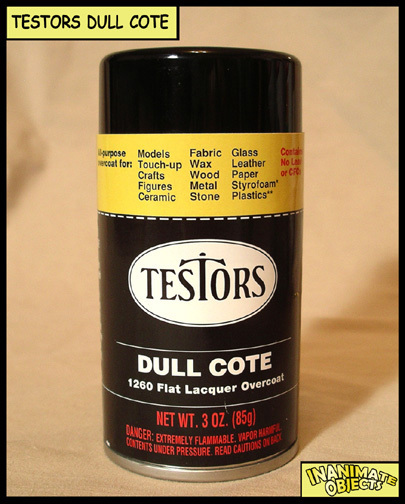 You can also learn more about Dull Cote via the Testors site. The black foot-peg stands seen throughout this site were purchased directly from a dealer at a comic book/sci-fi convention many years ago. They can still be purchased at ProTech Products. The Type I (modern) stands fit modern Star Wars, and with a little effort can fit Mattel’s Justice League. (I usually drill the foot hole a bit wider in the latter’s case.) 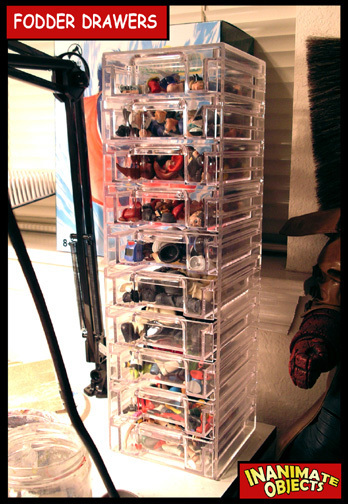 The Type II (vintage) stands fit vintage Star Wars, most DC Direct, Hasbro Batman lines, McFarlane, LOTR, and most anything else. 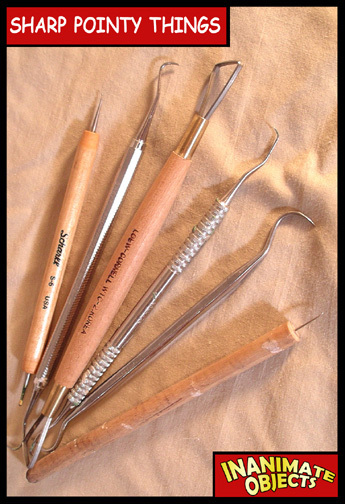 These are both fairly common tools, found in hobby, art, and hardware stores. An X-acto knife is a small, fine blade. (Available in a variety of sizes and shapes.) It’s excellent for sculpting and slicing small parts. 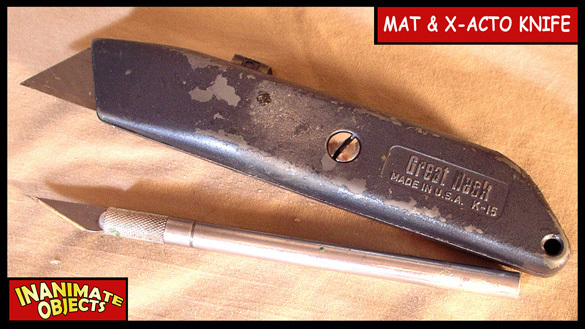 A mat knife, sometimes called a utility knife or box cutter, is a larger blade that can handle heavier tasks without as much risk of breaking (like slicing through thick plastic). 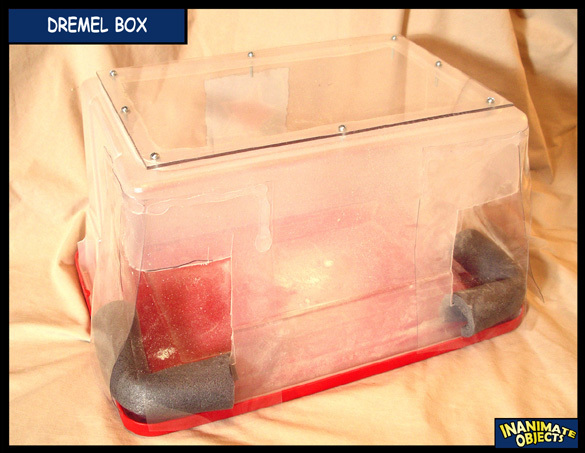 A Dremel is a marvelous, multi-use tool available in most home improvement stores. It’s a small rotational motor. 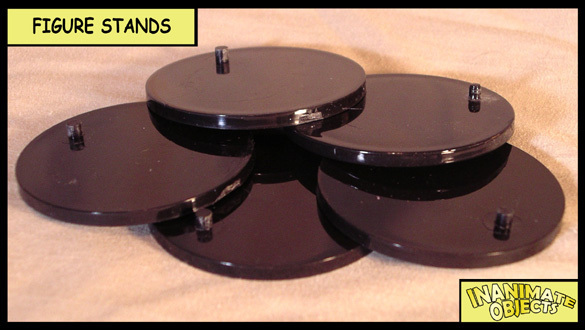 Dremels are designed to be used with numerous bits serving different purposes. 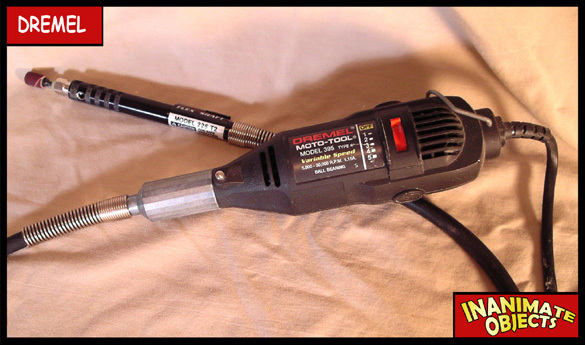 It can act as a drill, a sander, a grinder, a small saw, a polisher, etc. It’s great for eating through chunks of unwanted plastic. A basic set can start around $75, and is probably the best investment a customizer can make as far as tools are concerned. Easily found at most home improvement stores. 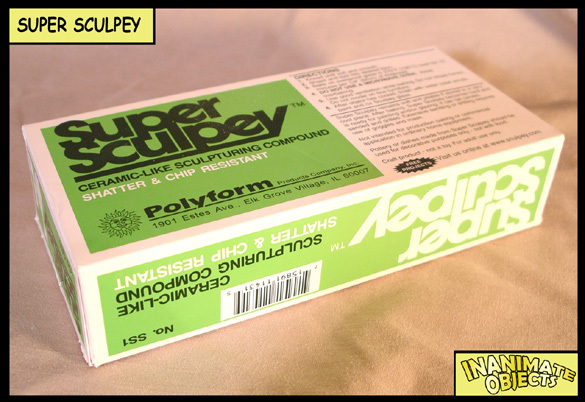 Every substance has its own qualities, be it ABS or PVC plastics, Magic Sculpt or Alumilite, styrene or wood. If I need to remove a large mass of something that can’t simply be cut off with a mat knife or saw, I’ll reduce that mass with the large, coarse sanding drum on the Dremel. Sometimes I’ll use the 1″ upright belt sander in the garage. Usually that’s not needed, so I’ll start with the fine sanding drum. From there, I may go at it with the polishing brush bit, or I might switch to some medium-to-fine sandpaper (I prefer 220). More often than not I’ll go back and forth between paper and bits. When I’m satisfied, I’ll put a final polish on using some extremely fine sandpaper (so smooth it feels almost like normal paper). Some materials sand better than others. It’s just a matter of patience, really. For the record, I hate sanding. But it has to be done. 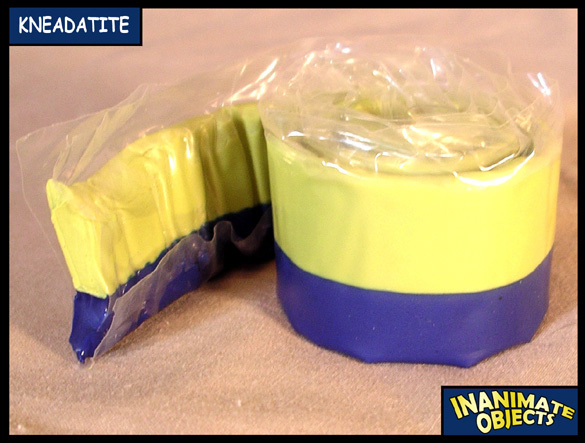 Kneadatite is a two-part, air-drying compound. It’s primarily designed as a plumber’s epoxy, but artisans have found it to be a great sculpting medium. When mixed, it is pliable and holds its shape. It cures in about four hours with a consistency not unlike PVC plastic. I prefer air-drying over heat-drying mediums as I don’t risk heat damage to the base figures. 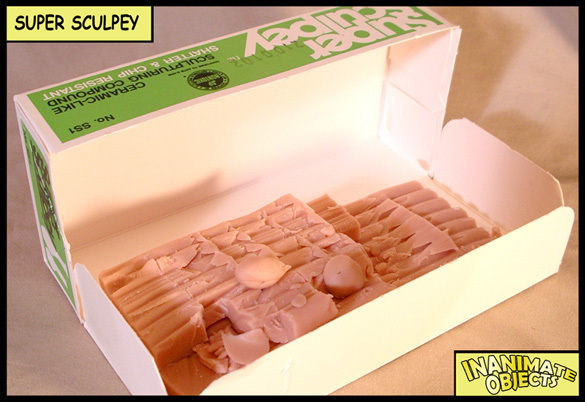 (Some of my earlier projects were destroyed in the oven while trying to cure Sculpey.) Also, Kneadatite is very durable when dried. It has a slight flexibility that allows it to “give” under pressure without snapping. For more information about Kneadatite, please visit the manufacturer’s site polymerics.com. A plumber’s epoxy is any sort of compound that’s used to seal pipe fittings. 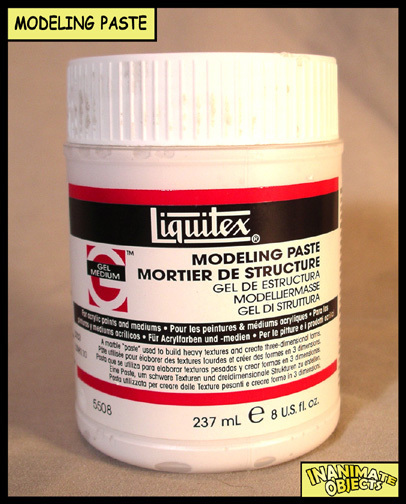 However, many plumbers epoxies make great sculpting mediums as well. Kneadatite above is but one example. A more typical plumbers epoxy is available at most home improvement stores. 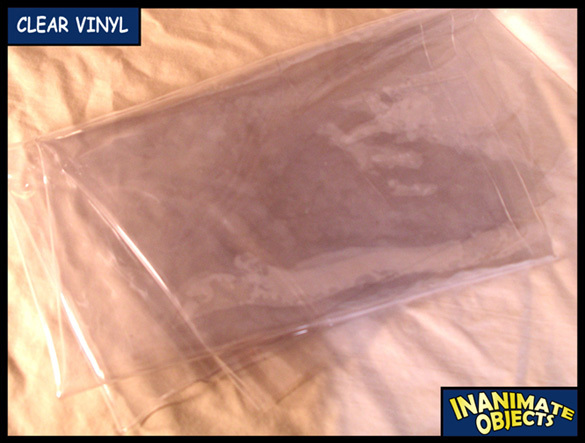 It usually dries quickly (5-20 minutes) and has a rock-like texture. I’ve found this to be useful when sculpting large areas or filling large holes that don’t require much detail. It can be sanded smooth and then painted. 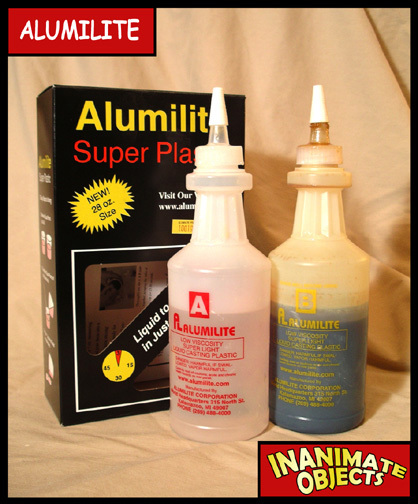 Some art and hobby stores will carry Alumilite. However, I have been known to order directly from the manufacturer, alumilite.com. You can many emblems in the Inanimate Objects downloads section. If you see something printed in the backdrop of an Inanimate Objects photo that’s not on the download list, drop me an email. I may be able to help. 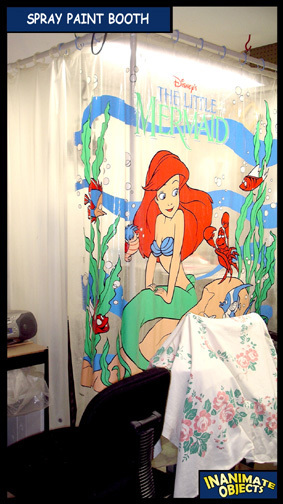 This is known as decoupage, and there are a number of ways to go about this. (There are also many other customizers out there who are higher authorities on this subject.) In general, you’ll want to apply some of the gel medium to the back of the paper emblem, and some to the target area of the figure. Apply the emblem, and then use the brush to smooth out the excess gel medium along the edges. You can even brush the gel medium over the emblem, so as to seal it. This action along the edges also helps to smooth out the “seam” of the emblem, allowing it to appear as though it were printed directly on the figure. One warning: Don’t smear too much if your emblems were made on an ink-jet printer. I’ve smeared many a super-hero symbol this way. (Laser printed emblems won’t smear.) 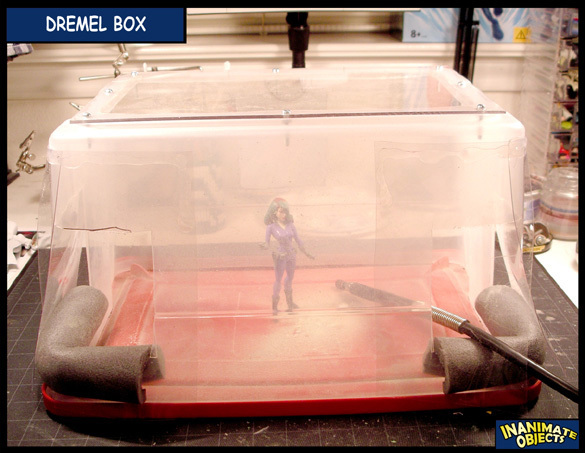 If you do use ink-jet printed emblems, try spraying them with Testor’s Dull Cote or some other fixative before applying to the figure with matte gel. That will cut down on the smearing.